James as Link! 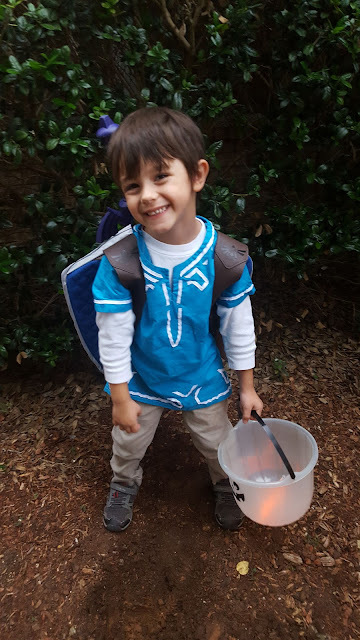 He said he wishes I had named him Link instead of James. Sorry dude! I named you after your grandfather instead. It was a miracle that I managed to get this done at all considering how nauseous and exhausted I was in the midst of all my first trimester misery during October, but I did it! 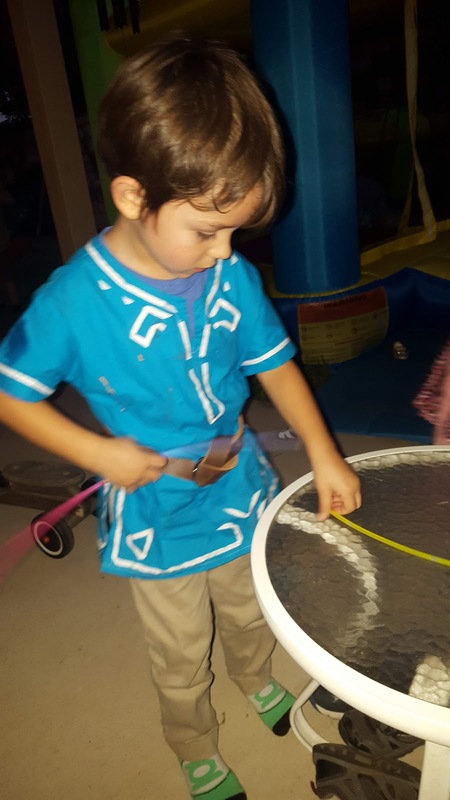 With the belt that Uncle John made, which was promptly removed and lost the night of the Halloween party, never to be seen again. It was hard to get pictures of my impatient, wiggling 4 year old just before trick-or-treating! The Hylian sword and shield-backpack I got off of thinkgeek.com. They were on super sale AND I had a thinkgeek gift card, so I paid nothing for them. I patterned it from one of his larger t-shirts since I knew that this twill wouldn't have the stretch of jersey-knit t-shirt material. No mockup or anything, just went for it. 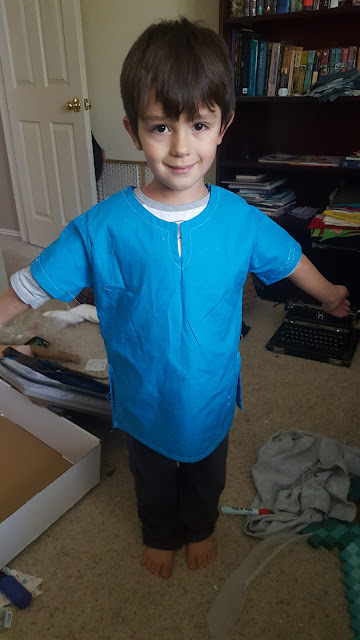 I've made enough renfair style shirts to be pretty good at this by now! I struggled with how to add the white decorative design. Paint? Embroidery? I ended up using white grossgrain ribbon and zigzag stitching it on, and using fray-check to keep the edges neat. 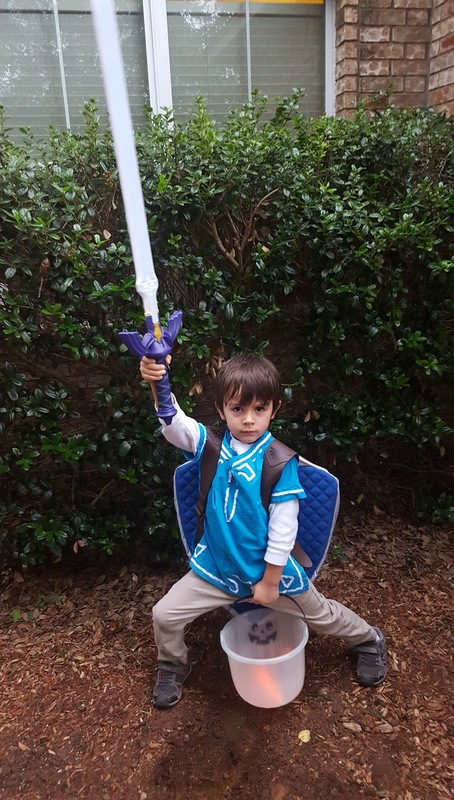 It's not perfect, but it's good enough for a 4 year old and for Halloween! He keeps the tunic in his drawer with his regular shirts and wears it all the time, so I guess all this work was worth it! It's held up to several washings so far but its times like this that I wish I had a serger to finish the inside seams a bit sturdier. I've been searching for a used one in my area, but I keep waiting for just the right combo of price and quality. I'm sure he will end up wearing this to the Sherwood Forest in the spring too, but maybe I can get around to finishing Jack and Gunnar's refair outfits by then!